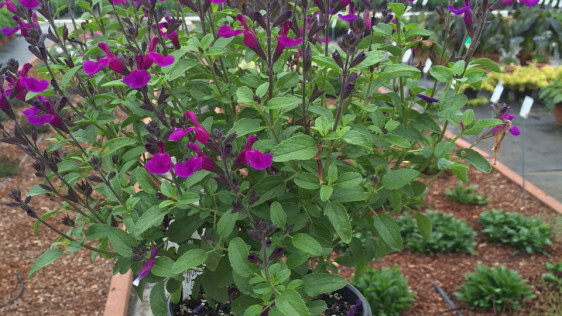 This week I chose a fairly new specimen called VIBE Ignition Purple Sage. My first reason for selection this plant is my passion for purple flowers. Especially deep purple flowers! I particularly love that it's heat and drought tolerant because we do live on the East Coast. The Mid-Atlantic East Coast! I think we all know how much easier our gardening life can be when we choose landscaping plants that possess these qualities. 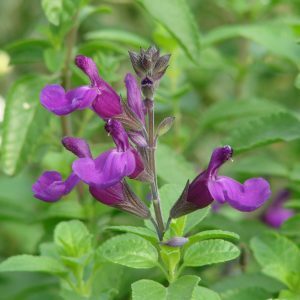 I've also become a fan of the small varieties, and this petite sage sets off an explosion of vibrant purple flowers all summer long. This plant is also one of the most humidity tolerant plants in the sage group. 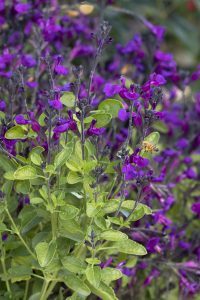 It's a perfect addition to your summer garden borders, as a way to attract wildlife, loves life in a container and makes a great cutting flower, too. This perennial reaches grows between 18 and 24 inches tall and wide. also one of the most humidity tolerant plants in the sage group. It’s a perfect addition to your summer garden borders, as a way to attract wildlife, loves life in a container and makes a great cutting flower, too. 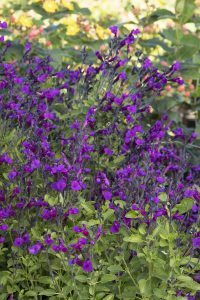 This perennial reaches grows between 18 and 24 inches tall and wide.